Following the resolution of the fertility crisis that nearly caused their extinction, the Andorian people now stand ready to rejoin the United Federation of Planets. The return of one of its founding member worlds is viewed by many as the first hopeful step beyond the uncertainty and tragedy that have overshadowed recent events in the Alpha Quadrant. But as the Federation looks to the future and the special election to name President Bacco’s permanent successor, time is running out to apprehend those responsible for the respected leader’s brutal assassination. Even as elements of the Typhon Pact are implicated for the murder, Admiral William Riker holds key knowledge of the true assassins— a revelation that could threaten the fragile Federation-Cardassian alliance. Questions and concerns also continue to swell around Bacco’s interim successor, Ishan Anjar, who uses the recent bloodshed to further a belligerent, hawkish political agenda against the Typhon Pact. With the election looming, Riker dispatches his closest friend, Captain Jean-Luc Picard, in a desperate attempt to uncover the truth. 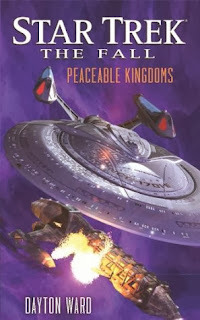 But as Picard and the Enterprise crew pursue the few remaining clues, Riker must act on growing suspicions that someone within Ishan’s inner circle has been in league with the assassins from the very beginning . . . . If anything can wipe the J.J. Abrams lensflares from my eyes and make Star Trek something I can get excited about once again, this series looks like it may just fit the bill. A five-book story arc that takes place over a sixty-day period, this one crosses "all aspects of The Next Generation and Deep Space Nine universes." I've already picked up the first book, Revelation and Dust by David R. George III, but I'm looking forward to immersing myself in the series for one long back-to-back read. Nice pick! Hope you really enjoy this one once you read it! Been a while since I read a Star Trek book. Sounds like a good series to dive into. oooh, is my dear Troy in the story too? Well, I hope you'll enjoy the series :) Happy reading!